The white peaches have returned, the strawberries are perfect, and the season’s first pinky-red cherries are offering their teasing, tart promise of the darker and sweeter varieties to follow. Yes, just as our desire for winter’s citrus is waning, the new stone fruits and berries are arriving to brighten market tables and kitchen counters alike. I doubt that anyone bakes with the precious first rounds of summer fruit—the $4-a-half-pint raspberries, the $10-a-pound blueberries, the tight-fleshed, golf ball-sized nectarines. These are luxuries, eaten before they even make it to the fridge, scattered over ice cream or stirred into Greek yogurt and honey. Soon, though, we’ll have bounty to take for granted, and then Nigel Slater’s new book, Ripe: A Cook in the Orchard, will come in handy. This fat, handsome, persimmon-colored volume is a companion to Slater’s earlier cooking-and-gardening book, Tender: A Cook in His Vegetable Patch. 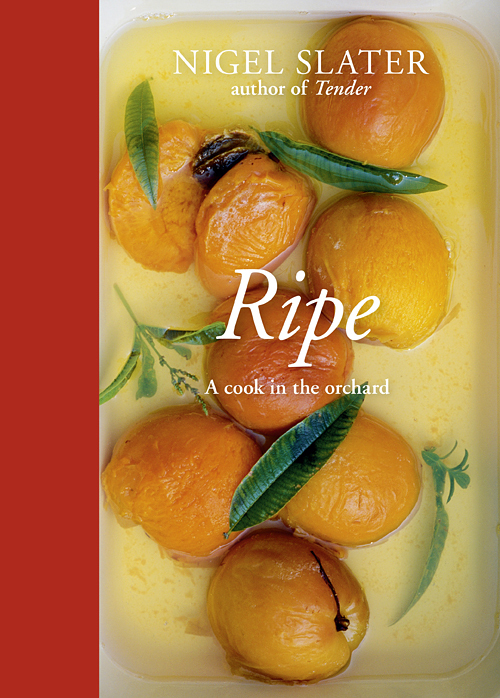 As you might guess from the title, Ripe finds the British food writer and cookbook author moving from his backyard vegetable beds into the trees, vines, and canes that put a multitude of home-grown fruits and nuts onto his table. As in Tender, Slater writes only about what he can grow in his particular 55-yard stretch of London soil, which means, perhaps disappointingly to Bay Area readers, no citrus, no almonds, no loquats, no pomegranates, persimmons, or avocados. But he has managed, surprisingly, to nurture both a grapevine and three fig trees, along with a host of very British treats—gooseberries, red, white, and black currants (all of which may take some sleuthing to track down even in our well-stocked farmers' markets), rhubarb, damson plums, elderberries, quinces, even the medlar, an odd, old fruit, common in Shakespeare’s day, now a rarity even in Britain. (The small, brown, apple-like fruit must be picked hard, then “bletted,” or left to soften until it has almost rotted. Slater admits to planting his “quaint, hopelessly crooked” medlar for the sheer mystery and romance of it. The tree has since rewarded him with gorgeous blossoming in spring, followed by just enough fruit to make a couple of jars of tart-sweet amber jelly, good with pork and game, in autumn.) His nuts are European ones: hazelnuts, of course, along with chestnuts and walnuts. The recipes, too, are very British: cozy plum crumbles, a myriad of baked apples, Victoria sponge, “messes” of crushed meringue, whipped cream and berries, gooseberry fool, summer pudding, even skillfully updated versions of centuries-old possets and syllabubs. As a longtime food writer and former restaurant chef, Slater has a savvy savory palate that can dip into the herb-and-spice pairings of cuisines around the world and translate them, deliciously, into satisfying, boldly flavored dinners without seeming dilettantish. He pairs green salad with peaches and ham, and mackerel with gooseberry sauce. 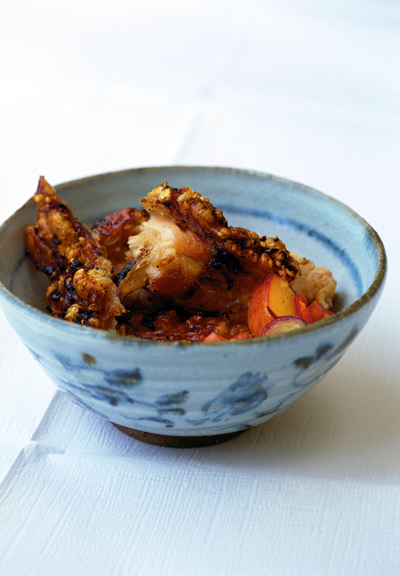 Guinea fowl is roasted with figs, a Chinese-style pork roast is glazed with plum-ginger sauce, and apples accent pheasant, duck, blood sausage, and rabbit. Turkey gets a stuffing of apricots and pistachio; pork goes with peach salsa, blackberry-and-apple sauce, pears, quinces, plums, even rhubarb. When it comes to sweets, however, he’s a home cook, still with an English schoolboy’s love of the crumbly and the comforting. Not for Slater are the more contemporary, multi-layered (and quite delectable) concoctions found in books like pastry chef David Lebovitz’s Ripe for Dessert. Instead Slater, growing preciously small backyard amounts, keeps his preparations full-flavored and unfussy. There are rough-hewn galettes, juicy deep-dish pies, and nearly two dozen easy, buttery, not-too-sweet cakes, weighted with nuts and fruits, gently spiced, equally good as a breakfast nibble, a teatime pick-me-up, or a family dessert. However much he may enjoy summer’s peaches, he saves his most finely wrought enthusiasm for the less obvious pleasures of the autumn and winter table--its apples and quinces, pears and walnuts. I cannot think of another food writer who has penned such rhapsodies in honor of the baked apple and its sweet, buttery-topped sister, the apple crumble. While many of the cold-weather, elegantly named heirloom varieties of apple (like D’Arcy Spice, Orleans Reinette, Ribston Pippin, and Cornish Gilliflower) that Slater espouses are rarely seen in the Bay Area, his enthusiasm should encourage you, come fall, to seek beyond the easy Fuji and Galas to the more complex, older apples like Esopus Spitzenburg, Ashmead’s Kernel, or Cox’s Orange Pippin. There is a moment, sometime around the middle of September, when this garden, this diminutive hortus conclusus I have made in an 1820s London terrace, truly becomes the garden of my dreams. The leaves are turning from green to gold, amber, and rust, the last of the fruits hang crimson and smoky blue on the trees, the pumpkin-colored dahlias and Michaelmas daisies have collapsed like drunks across the gravel path. The garden darkens to the color of ginger cake, here and there a shot of saffron, brilliant ochre, or deepest crimson. The colors, I guess, of the Vatican at prayer. Ask your butcher to score the skin finely for this, as the crackling is essential. The first brief roasting at the higher temperature sets the crackling on the route to crispness. These ribs are not sweet and sticky like the ones in The Kitchen Diaries, but lightly crisp and lip tingling. Adapted and reprinted with permission from Ripe: A Cook in the Orchard by Nigel Slater, copyright (c) 2010, 2012. Published by Ten Speed Press, a division of Random House, Inc.
1. Put the pork in a china or glass dish. Peel and crush the garlic to a paste, stirring in the soy, oil, salt, chile flakes, and five-spice powder. Spread this paste over the skin and underside of the pork and leave it to marinate for a good four hours, if not overnight. 2. Preheat the oven to 425°F (220°C). Place the pork in a roasting pan, then cook, skin-side up, for about twenty minutes. 3. Lower the heat to 400°F (200°C) and continue cooking for a further forty to fifty minutes, until the skin is dark and crisp. Leave to rest for ten minutes before carving. 4. Make the salsa. Trim and finely chop the green onions. Finely chop the chile. Peel, pit, and finely chop the peaches and tomatoes and chop the cilantro. Toss gently, then dress with the lime juice and olive oil. Serve the pork with the salsa.